October 2nd has been announced as LiveSTRONG Day 2010. On this day, 514 events will be held in the 416 cities of 52 countries to raise awareness and show support for the fight against cancer. LiveSTRONG Organisation, founded by Multiple Tour de France Champion, Lance Armstrong is a body that inspires and empowers people affected by cancer. To better understand what they do, please visit here. I first learnt about this organisation last year at Barbara's blog, WinosandFoodies. I was still new to blogging then and had been inspired by her story to participate in her own Livestrong event, LiveSTRONG With A Taste Of Yellow. LiveSTRONG Day has now gone massively global. Unfortunately, there is almost zero awareness in Singapore. How I wish some organisation would organise a cycling event in Singapore on LiveSTRONG Day to raise awareness. 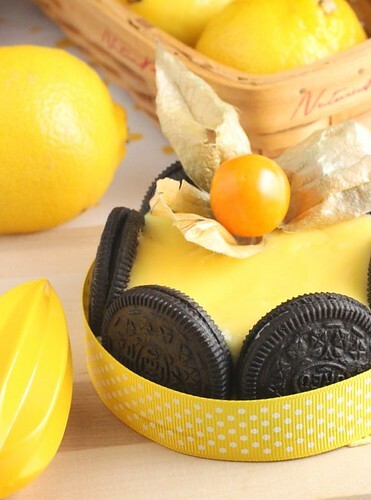 How can one go wrong with Oreo, Lemon and Cheese Cake? Simple to put together, this is one cheese cake that does not even ask for a base. 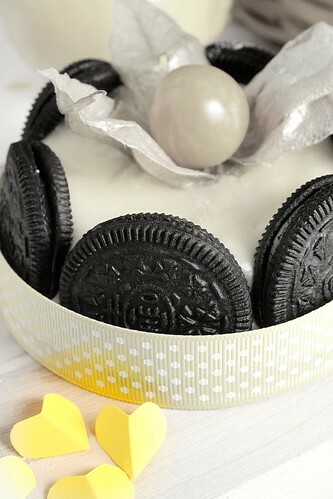 A cake ring is wrapped with baking paper before it is lined with a ring of Oreo Cookies. (Held in position with a dot of softened butter) The cream cheese can be prepared quickly and this is baked without a water bath. Easy breezy and once baked, this can be dressed up easily with fruit toppings and ribbons... and you have a lovely creation that makes you feel like a proffessional patissier :). 1. Beat cream cheese, sugar and corn flour to mix well. Add sour cream and beat until smooth. Add egg gradually, one by one. 2. Add vanilla extract, lemon juice and zest. Scrape the ingredients from the sides of the mixing bowl to the sides of the mixing bowl to the center and mix well. Pour into the cake mould. Bake at 140C in preheated oven for about 45-50mins. This is eye opening. Sadly, I myself didn't know of LiveSTRONG Day till I'd read about it over here. Thank you! Agreed: Life is fragile ... and UNPREDICTABLE. Live strong and to the fullest! Hi there, I notice you always don't cut the cake to show the insides, perhaps you can do that next time? You also didn't cut the mooncake in your previous entry. I'm sure your readers would like to see the cross sections. A gift..it looks like a gift.. Coeur en Cage.. Cerises de terre..I love how we call them... hearts in a cage..It goes well with your post. Sheilamae- a valid suggestion. Will take note the next time. Also, thanks for bringing the awareness about this event. Coming over here always make me leave with something new..thanks for letting know about the livestrong event, very meaningful I'd say...so coincidentally 2 Oct is also my youngest sister's birthday! Shirley, what a gorgeous dessert - I wasn't also aware of Livestrong until I heard about it from Winos and Foodies - am glad to see that bloggers are able to raise awareness through food - it's a win win situation. Shirley this is such a good cause and I love what you did with your taste of level! Sweet and classic, yet still totally intriguing and appealing all at the same time! very very beautifully executed Shirley! what a gorgeous contribution. Live strong indeed ..life is fragile. Great cause, cake, and presentation, Shirley! 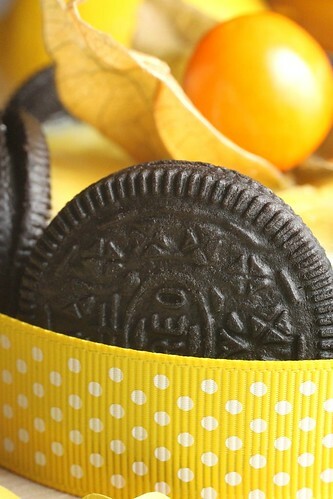 The oreos around the edge are a great idea that looks so sophisticated. Wow, it looks really yellow!!! Thanks so much for joining A Taste of Yellow again Shirley. This is such a lovely post. Thanks for sharing the awareness. What a stunning cheesecake...and for such an important cause! This is my first time visiting your blog, and I'm so happy that I found you! 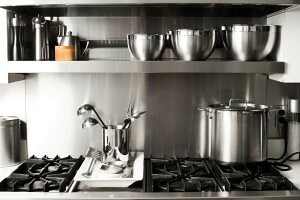 Your recipes, photography and writing are top-notch. Thank you for sharing! Shirley, beautiful cake and lovely post, thanks for letting us know about the livestrong event. Von,you mean the fruit? It's a gooseberry.It is rare - only fancy patisseries use these... :) Quite tasty, sweeter than Kumquat. Such a pretty cheesecake and the Livestrong event sounds very meaningful..I totally agree that one should live with no regrets. Lovely cake!!! Love the colour!! It's a meaningful event. I didn't know about this loveSTRONG day. :P Your cheesecake has a strong yellow, which I believe was a good choice for this event. By the way, where did yo get the gooseberry? Hardly able to find it. Aimei- I found them at Carefour :)... around $4 only...cheaper than blueberries now. awww it's gorgeous! Love the black and yellow colour contrast! Shirley what a cheerful and lovely cheesecake =) You're so creative! Very beautiful cheesecake ! Love the presentation! 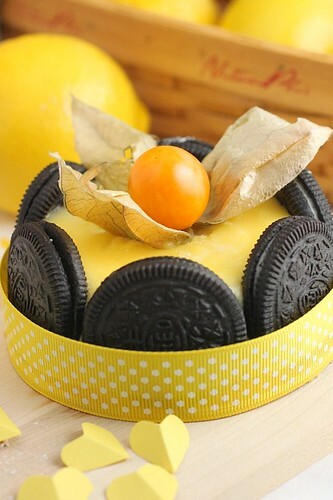 I love oreo and your cheesecake looks so pretty and bright :)!! a little piece of art,gorgeous! Love the colours! Looks beautiful! What a beautiful cake for a good cause. The cheery yellow really stands out! What a gorgeous looking cake! Love how you've presented it - looks very stylish. I'm so glad Barbara's round up for Livestrong with a taste of yellow brought me here. What a really original and beautiful post. I'm glad I found you - I learnt something new today...thanks for sharing.